Every summer, we gather on the grassy lawn in the shadow of the lighthouse at Ned's Point in Mattapoisett. Like a homecoming, it's at one level a somatic hot air balloon ride and on another level a pleasingly slow plunge into the Grand Canyon of your physical and energetic bodies. 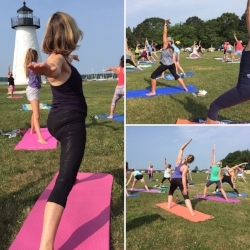 Lighthouse yoga runs every Saturday from 8:15 - 9:30 a.m. in the summer months, weather permitting. We usually launch it on Memorial Day weekend and continue until after Labor Day, as long as the weather holds, which is usually the second week of September. Many students prefer to bring a blanket to lay underneath a yoga mat, water, sunscreen, and bug spray.